On the Settings menu, you should head to System to find the audio settings for Kodi. 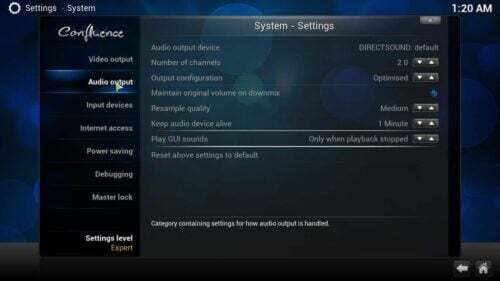 It is clear that, for configuring Kodi, there are already automated solutions, like for example Kodi Configurator for Android, which chooses the best settings available for your device -though you can still change them later on- and even adds content and streaming sources, making it an ideal piece of software to use with Android media players. But sometimes it's better to take matters into our own hands; specially if the quality of our audio is involved. What do all these Kodi audio settings mean? We tell you in this article. 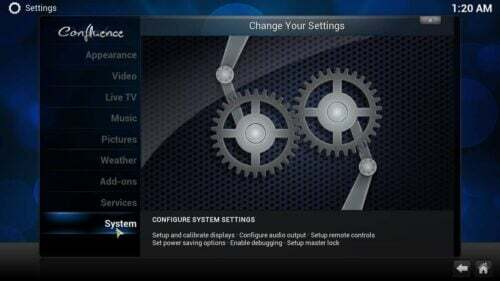 Kodi Audio Settings: main audio settings. 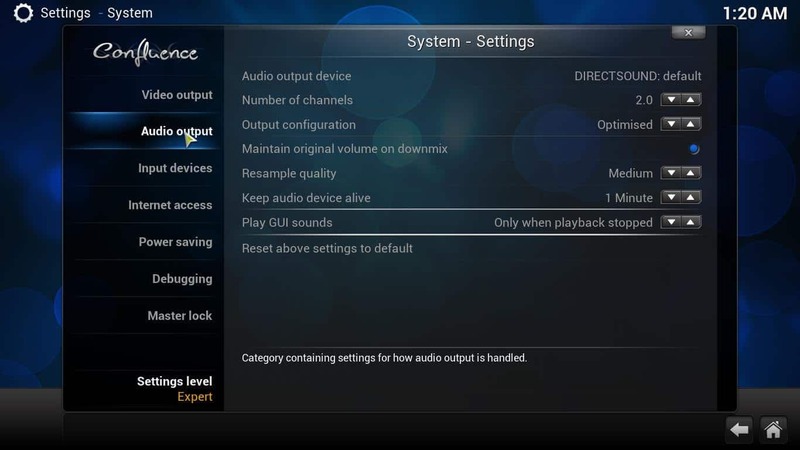 Kodi Audio Settings: audio playback settings. I'm overwhelmed by so many Kodi Audio settings! These are some of the settings you can change in the Audio output configuration. Audio output device: Here you can select which one of the audio outputs from your computer you will be using. Depending on what you select here, some settings further down might be enabled or not. Number of channels: If your audio connection is digital, this represents the channels supported by the audio connection; if it's analog, it will represent the number of speakers your system is using. Output configuration: You can set this option to Fixed, Optimized or Best Match. This will let you know if properties such as sampling rate and speaker configuration will change during playback to match the source (which is done in Best Match setting); will be set at the start of playback and not change (corresponds to Optimized); or will be set by the value indicated in settings at all times (which would be the Fixed option). Limit sampling rate (kHz): If you set fixed output, this indicates the sampling rate. If you are using SPDIF, this is the maximum sampling rate. Stereo upmix: When enabled, it lets 2-channel audio be upmixed to the number of channels set in Kodi audio settings. Normalize levels on downmix: Also can be called Maintain original volume on downmix. 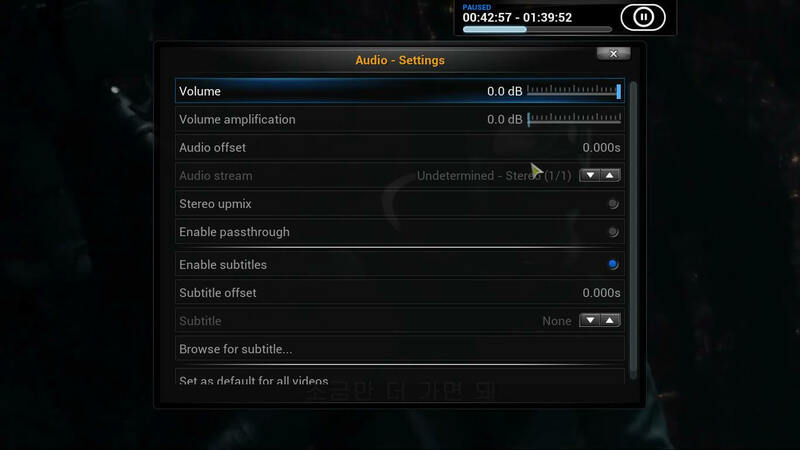 When enabled, keeps the volume of the stream, at the cost of compressing dynamic range. 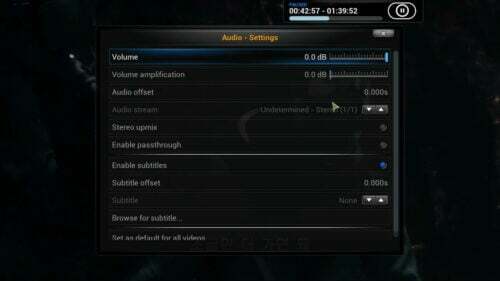 When disabled, volume will be lower but the dynamic range will be maintained. Keep in mind the dynamic range is defined as the difference between the quietest and the loudest sounds in an audio source; thus, you should enable this setting if the dialogue in movies is barely audible. Resample quality: If you need to have audio sampled at a different rate than the source, this is the option you need to tweak; you can set it on Low, Medium and High, but the latter two will consume more computer resources. Keep audio devices alive: Defines the time audio devices will wait before entering a suspended state. It also has Always (audio devices never suspended) and Off (audio devices always suspended) settings. This setting uses a lot of CPU resourses, so depending on your hardware it might not be available. Play GUI sounds: Define whether you want to hear GUI sounds or silence when browsing through the menus. You can also have the sounds play only if media playback is stopped. Enable passthrough: With this setting you can enable passthrough Kodi audio output for encoded audio formats. Passthrough output device: Only useful if you enabled passthrough audio, this lets you select the device you will use for audio playback of encoded formats. Dolby Digital (AC3) capable receiver. Enable Dolby Digital Transcoding: To be selected in case the audio output device only supports multichannel audio. Dolby Digital Plus (E-AC3) capable receiver. Make sure you select a format compatible with your device to avoid slowness or freezes on your media! Click the icon of the speaker (on Confluence) to access the in-playback audio configuration menu. Volume: Select the volume of your media. Audio offset: Sometimes the audio and the video seem to go separate ways. With this setting you can bring them back on track together and make them sync properly. Audio stream: Useful for media with more than one audio stream, you can use this option to select which one you want to hear. Stereo upmix, Enable passthrough: They are the same as the ones you can set on the main Kodi audio settings. See above. Enable subtitles, Subtitle offset, Subtitle and Browse for subtitle: These options are for subtitle control; bring them over your media, make them sync properly, browse your downloaded ones for the movie, or download new ones. Set as default for all videos: Make these settings apply to all videos from now on. A look at the in-playback audio options for Kodi. So am I! But hey, it's awesome we have such an amazing tool at our disposal for free, right? Having many options it means Kodi can adapt to any user's needs and satisfy a huge number of people. 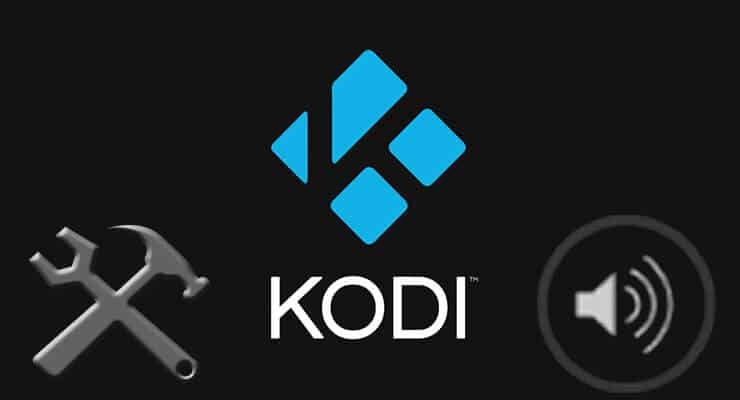 If you want to try out these settings experiment with them and perhaps one of the best movie addons for Kodi, or sit back and relax watching the top live TV addons for Kodi; I'm sure you will have a great time and, perhaps, hear your movies a little bit better!